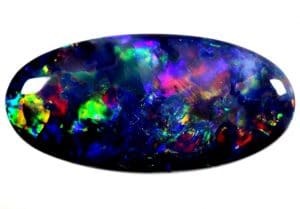 Opals vary in optical density from opaque to semitransparent and show a form of iridescence. Black opals are the rarest, whereas white and greens are the most common. Very sensitive to pressure and thermal shock (hot or cold), which causes crazing (surface cracking). This soft and fragile gem requires special care. Pearls are organic by nature and require moisture. The oil of the skin improves their lustre. Store pearls separately from other jewellery in slightly damp linen to prevent pearls from drying out in low-humidity atmospheres. Never expose pearls to chlorinated water. Avoid all detergents, perfume, make-up, and sweat, as they tarnish the lustre. Wipe pearls after wear, using a soft cloth. 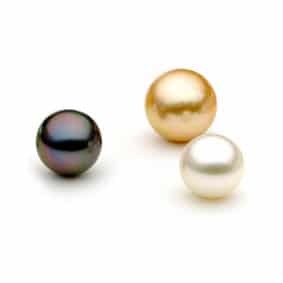 Pearls should be worn on clean, dry skin. It is advised to change the silk thread once a year, separating the pearls with a knot to avoid a broken string. The Precious Gemstone Emerald is of the green variety of Beryl. 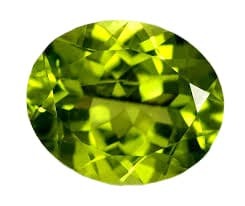 It is the most famous and valuable green gemstone. Its beautiful green color, combined with durability and rarity, makes it one of the most expensive gemstones. Most emeralds are highly included, so their toughness (resistance to breakage) is classified as generally poor. Emeralds have a hardness of 7.5–8 on the Mohs scale. Transparent rubies of large sizes are even rarer than Diamonds. 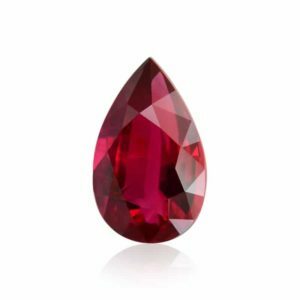 Ruby is the red variety of the mineral Corundum and has a hardness of 9 on the Mohs scale. Peridot rates 6.5 to 7 on the Mohs hardness scale. It has fair to good toughness and is durable enough for jewelry wear but should be worn with some care so as not to scratch it or subject it to hard blows that can fracture it. Sapphire is the most precious and valuable blue gemstone, a variety of the mineral corundum. It is a very desirable gemstone due to its excellent color, hardness, durability, and luster. The most desired colour is a pure cornflower-blue. They come in every color of the rainbow. Except red. Sapphire has a hardness of 9 on the Mohs scale. 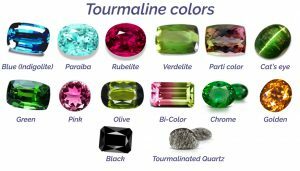 Tourmaline has a variety of exciting colors with one of the widest color ranges of any gem species, occurring in various shades of virtually every hue. Scientifically, tourmaline is not a single mineral, but a group of minerals related in their physical and chemical properties. The most commonly encountered colours are the wide variety of pink and green Stones that are pale in colour or have secondary colours of brown or salmon are not considered with high. Tourmaline has a hardness of 7-7.5 on the Mohs scale. Amethyst is the purple variety of the mineral Quartz and its most valuable and prized variety. Its name derives from the Greek “amethystos”, which means “not drunken”, as Amethyst in antiquity was thought to ward off drunkenness. Color is the most important. Amethyst colors range from pale lilac to deep reddish purple and ranging from transparent to translucent quartz. The finest amethyst is a deep purple color with minimal color zoning and it looks the best in daylight. 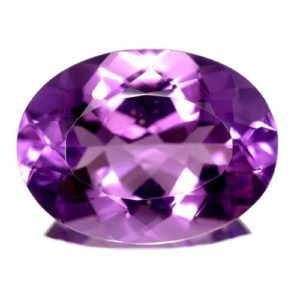 Amethyst has a hardness of 7 on the Mohs scale. Garnets are a group of silicate minerals that have been used since the Bronze Age as gemstones and abrasives. All species of garnets possess similar physical properties and crystal forms but differ in chemical composition. 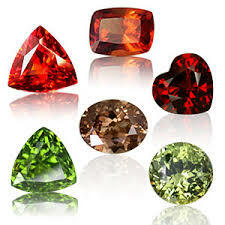 Garnets come in a variety of colors and have many different varieties. 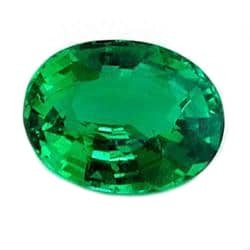 However, the most widely-known color of Garnet gemstones is dark red but green tsavorite & demantoid are the rarest and most valuable. Garnets are hard, durable and brilliant and are valued on carat weight, color, cut and clarity. Garnet has a hardness of 7– 7.5 on the Mohs scale.